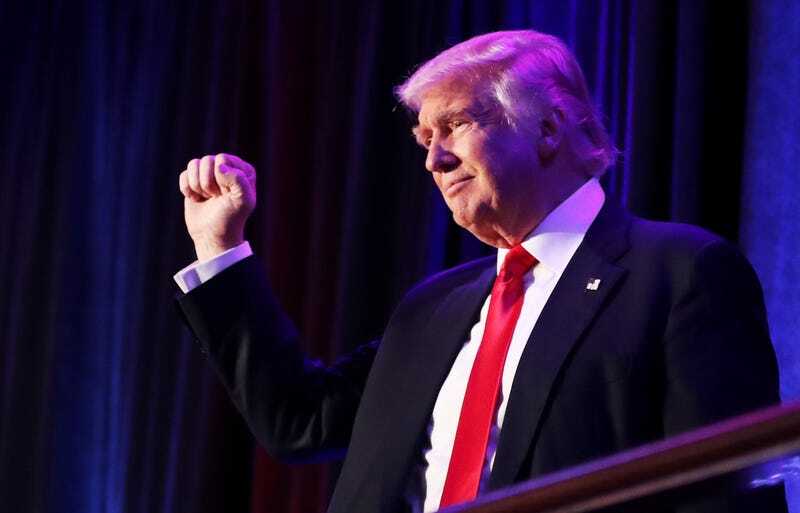 Republican President-elect Donald Trump acknowledges the crowd during his election-night event at the New York Hilton Midtown in the early-morning hours of Nov. 9, 2016, in New York City. The human embodiment of white privilege is the next president of the United States. Just after 2:40 a.m. Wednesday, news reports rang out that former Secretary of State Hillary Clinton had conceded the election to Donald J. Trump as several states remained too close to call but were unlikely to turn in her favor. Now Trump, a billionaire real estate tycoon, a man endorsed by the Ku Klux Klan, who proposed nationwide stop and frisk, will be the 45th president. Trump, an unconventional candidate who was caught on tape boasting about accosting women, who advocated banning Muslims from the United States, who has championed mass deportations and building a wall (that Mexico would pay for) to keep out undocumented immigrants, is on the precipice of becoming the most powerful man in the world—backed by a Republican-controlled Congress. Financial markets immediately took a hit amid the uncertainty of what a President Trump could bring. Short of some kind of electoral miracle, he will have control of the nuclear codes. He will be commander in chief of our armed forces, and he will be in our lives, for at least four years, as the head of our state. And it’s the fault of the white voters who elected him. It was not the fault of African-American voters, among whom Trump was polling dismally. It was not the fault of Latino voters, who mobilized against the candidate who demonized them. But it was white voters, college-educated and not college-educated, rich and poor, from red states and blue states, who, in the end, chose an untested, unstable man you could “bait with a tweet” to run our country. Why did they choose Trump? There will be much navel-gazing over this, much pondering and pontificating, but it comes down to this “Dewey Defeats Truman” finish for Trump. White voters, at the end the day, decided that the progress of the last eight years was enough. There is no other way to take this but as a repudiation of the historic presidency of Barack Obama, our nation’s first African-American president. It was also a rejection of the establishment and our institutions, in every form, as well as things like basic human decency in politics, polite society and those who dare to push back against racism and sexism in all forms. Trump had little in the way of a ground game. He lost every debate by every modern measure, was grossly underprepared and reluctant to adjust, pivot or change from his oft boorish and crass ways. He is the one they chose, and they chose him more than they chose Mitt Romney four years ago. And of Hillary Clinton, if this is the end, what an end. To become the first woman to be the nominee of a major political party—whose résumé read “lawyer,” “first lady,” “senator” and “secretary of state”; who put the cracks in the highest glass ceiling of the land—only to find that in the end, white voters preferred a man of no experience to a woman with a lifetime of it, has to be devastating. At 69 years of age, this was her last best shot at the presidency, and she has likely been rejected for a man who wants to pull the U.S. out of NATO and become buddy-buddy with Russian ruler Vladimir Putin. Now she faces an uncertain future where her opponent has rallied his followers in chants of “Lock her up” and has promised to throw her in jail. For now it seems that the last best hope of anyone fearing mass deportations, discrimination and desperation is either our Constitution or that much-promised pivot finally coming to fruition for a candidate who has promised to and will radically change our country.